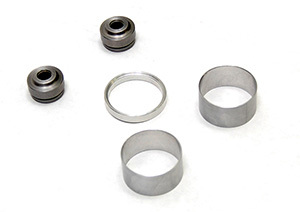 This kit enhances Lo-Speed Damping control for WP 4CS Forks. In stock form there are (2) Bleed Holes. One in the bottom of the Cartridge Tube and the other in the Seal Head at the top of the Cartridge. These holes, though small, have a large effect on Lo-Speed Damping control because the Damping Rod is only 8mm in diameter. 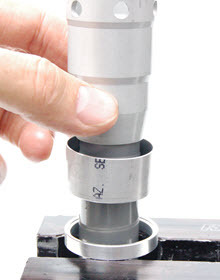 Note: This modification will make RT Adjustable Compression Bases more effective. 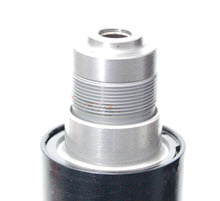 Pictured are the Seal Head Bushing Assemblies on top, the Sealing Sleeve Installation Tool in the center, and the Sealing Sleeves on the bottom. CAUTION: IF YOU ARE UNFAMILIAR WITH REBUILDING AND REVALVING FORKS, STOP!!! DO NOT PROCEED; SEEK OUT A QUALIFIED SUSPENSION TECHNICIAN. In addition to those required to rebuild the forks. 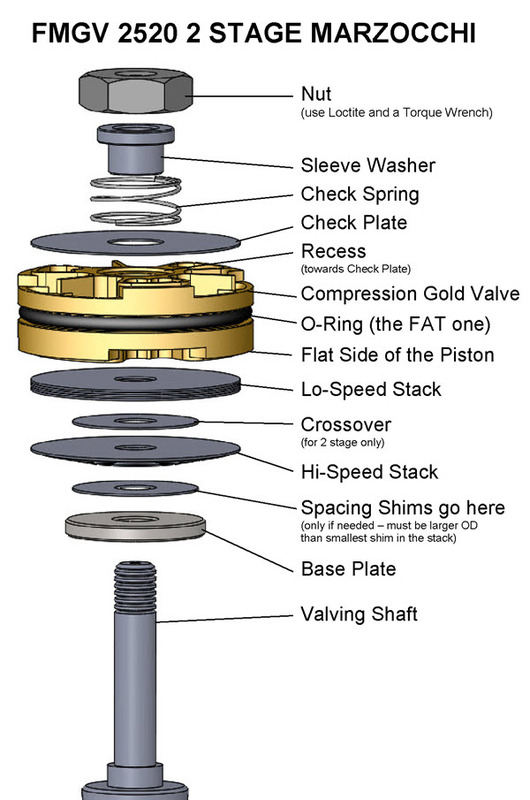 1- Disassemble the forks and the damping cartridge. 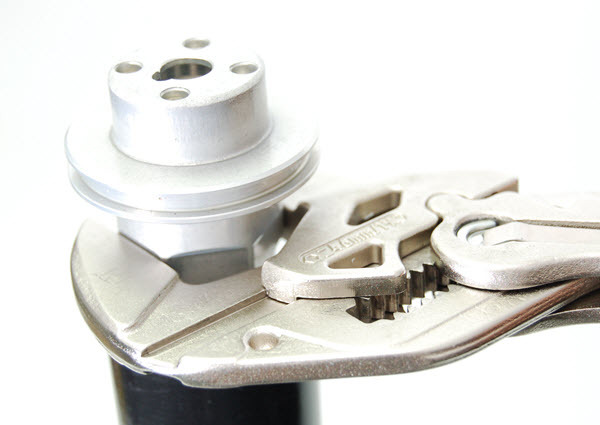 Remove the Jam Nut with Spring Guide, Lower Spring Seat (black plastic) and Washer. 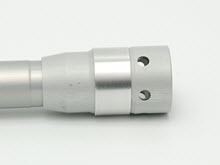 Remove the Damping Rod Assembly from the Cartridge Tube. Notice the small bleed hole. This little guy will be covered up by the time we're done. 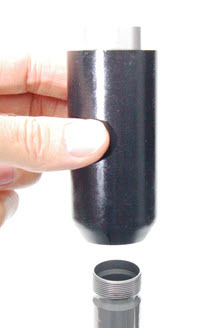 2- Remove the Seal Head from the Cartridge Tube. This might require a bit of heat to be applied to the area of the thread. The bottom of the Cartridge can be gently clamped in the "V" of TMVJ 065 Vise Jaws. You can either insert a closely fitting Phillips screwdriver through the holes in the bottom and let the end of the screwdriver hit against the vise jaw or you can screw in the Compression Base Valve Assembly to keep the tube from crushing and clamp more firmly. The picture below shows a Nipex Pliers removing the Seal Head. Before you freak out on me, this tool has smooth jaws and is made for this kind of stuff. Get one from your SnapOn Dealer, you'll love it. 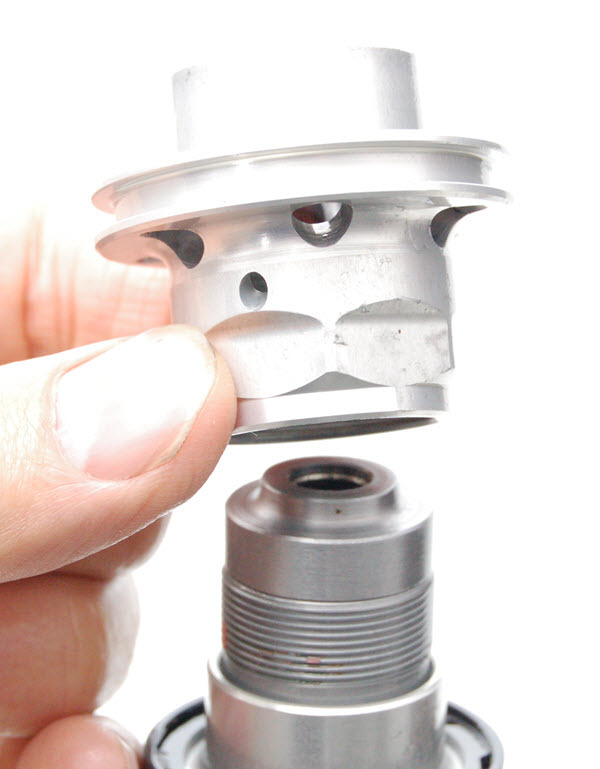 3- Remove the Seal Head Bushing Assembly. (It might be up in the top piece you just removed.) It slides out but sometimes the thread lock holds it in a bit. 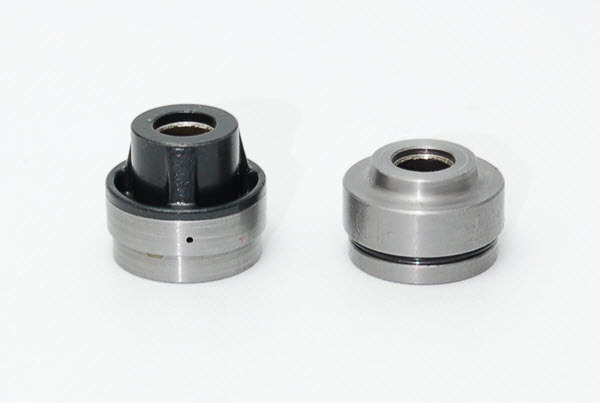 The stock Seal Head Bushing Assembly is on the left. 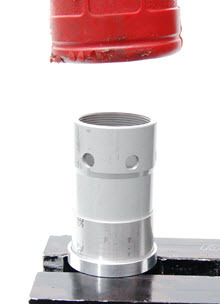 It has a check valve in it. Note the small bleed hole. The new Bushing Assembly is on the right. No bleed hole and no check valve. 4- Slide off the Reservoir. 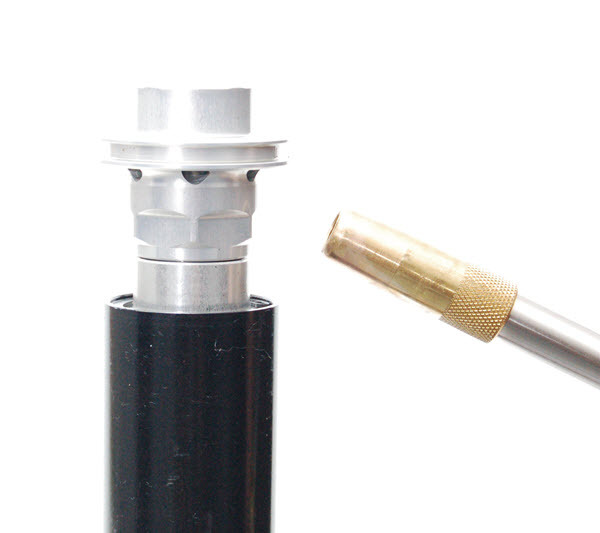 5- Install the Sleeve and Installation Tool onto the Cartridge Tube. The groove on the Tool should face the Sleeve. Invert the assembly and locate it in the "V" of the Vise Jaw. Do not squeeze the tube. 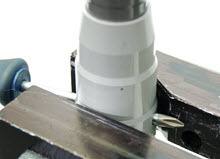 Tap down on the end of the Cartridge Tube until the Sleeve contacts the chamfer. This is what it should look like installed. Notice the bleed hole is covered. 7- Clean everything. Reinstall the Reservoir. Install the new Seal Head Bushing, use Hi-Strength Loctite. This mod is excellent paired with RT Adjustable Compression Bases, Compression and Rebound Gold Valves, and Hi-Performance Springs.